The portraits below make up a project that I worked on while living in Cape Town, South Africa this summer. Woodstock is an area of Cape Town that is undergoing rapid gentrification, and I wanted to find out how the new changes were affecting the local community. 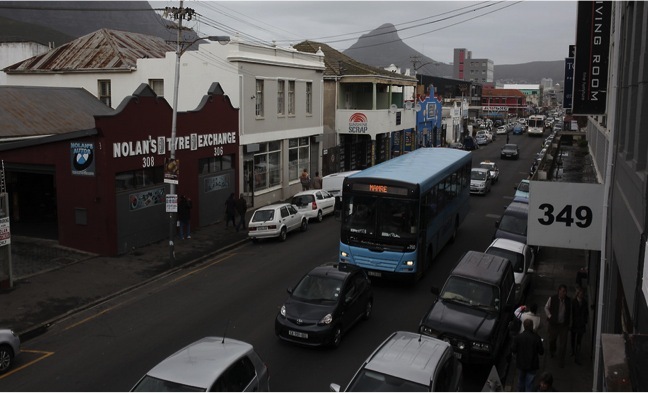 I spent most of my time on Albert Road (pictured below), a main thoroughfare in Woodstock where gentrification is evident. My first day in Woodstock, a new Mexican cantina was undergoing rapid construction. On my last day, it was open and welcoming customers. There has been an influx of new clothing shops, hip coffee joints, and healthy eateries around Albert Road in the past few years. Cape Townians and tourists flock to Woodstock on weekends to shop and soak up Woodstock's "hipster" vibe. I began asking locals what they thought about all the new changes, thinking that some would like the development, and some would not. What I realized is that gentrification is not a "good" or "bad" phenomenon. Gentrification is complicated, and everyone I spoke to had something different to say about their neighborhood. From these conversations, I realized that I was wrong to assume I could go into a community and ask people questions about a problem that I had framed. In the end, this project became much less "gentrification is good or bad for this reason," but rather "these are people who live in Woodstock and all experience the place in different ways." These are the Faces of Woodstock. Lynn does not live in Woodstock, but opened an “up-cycle” shop on Albert Road about two years ago. Antoinette has lived in Woodstock for 17 years, and works from home as a seamstress. Nazim and Fawzia moved from Mitchell’s Plain to Woodstock almost twenty years ago. Cecil has lived in Woodstock all his life, apart from when he traveled the world as a sailor. He is now retired. Allan Kupa has lived in Woodstock for 8 years, and has worked multiple temporary jobs since coming to South Africa as a refugee from the Congo. Loveness has lived in Woodstock since 2003, and works at a shop on Albert Road. Imraan has lived in Woodstock for twenty-five years and works for his friend selling olives at the Old Biscuit Mill market from time to time. Tammy has lived in Woodstock for twenty five years, and is an editor at the local newspaper, the Woodstock Live. JP lived in various countries around the world, including the U.S., Thailand, and London. He has been in Woodstock for over thirty years, and has seen the neighborhood transform from a dangerous, industrial center to a trendy tourist hotspot.